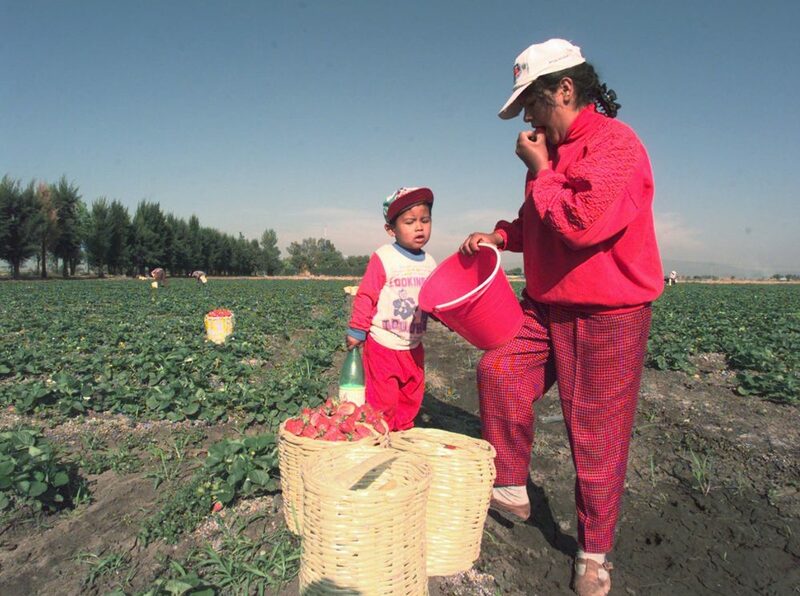 Andrea Rosales stops to snack on a strawberrry from a field she is picking in Irapuato Mexico, April 3, 1997, as her son Juan Antonio, 4, watches. Photo by Joe Cavaretta/Associated Press. Two hundred years ago this year, British economist David Ricardo published his monumental work “On The Principles of Political Economy and Taxation.” In it he outlined a theory of international trade based on the notion of comparative advantage. The idea is that each country does something, maybe many somethings, relatively well, and they can therefore specialize and trade with each other to their mutual benefit. Economics has since gone well beyond Ricardo’s analysis. But it remains instructive when it comes to agricultural products. And that brings me to strawberries. Everyone loves strawberries. They are sweet, they go well on ice cream and sponge cake, and, when covered in chocolate, they are a perennial favorite on Valentine’s Day. There is even a website called strawberries-for-strawberry-lovers.com. The red fruit, a commercial hybrid of the genus frageria, is primarily produced for U.S. markets in two states, California and Florida. In my part of the country, the Southern California coast, the strawberry fields seem to stretch forever, running inland from the ocean onto the Oxnard Plain. As an economist, I look at the fields and think, “There is Ricardo’s comparative advantage.” Southern California has a mild climate, moist sea breezes, and fertile soil: perfect for strawberry production. The climate that makes Ventura County, California ideal strawberry territory does not end at the Mexican border (and that won’t change even with a big beautiful wall). On the Baja California Coast near San Quintín, you also find strawberries. With the expansion of cultivation in Baja, Guanajuato, and Michoacán, states, Mexican production and Mexican exports have been increasing in recent years. One reason is the climate allows for Mexican produce, like its Californian counterpart, to mature through the winter. The consequence of being blessed with good soil and weather for strawberries is that both countries are major exporters of the crop. According to the California Strawberry Export Report, farmers in the Golden State exported about $400 million of fresh and frozen strawberries in 2016. Mexico exported approximately the same amount as California. Here’s where things get interesting. Mexican exports tend to be to the United States; the United States exports to Canada and other countries. Why does the United States both export and import strawberries? One reason is the different harvesting season in Mexico, and the perishability of fresh berries. But there’s another defining quality of strawberries: they are hard to harvest. Any hiker who has come across the wild version knows you have to stoop down and remove each fruit one by one. Machines, now used to pick some other crops, would damage the delicate berry and fail to separate ripe from budding fruits. So it is up to people, typically immigrants, to pick strawberries. According to the Los Angeles Times, a good strawberry picker in Southern California can earn $150 per day during the harvest season. That translates to $18.75 per hour, well above California’s current $10 per hour minimum wage. According to the California Legislative Analyst’s Office, between 25 and 30 percent of all non-strawberry pickers in the same region earn less than $12.50 per hour. So why are these less well-paid folks not clamoring for jobs in the strawberry fields? They have good reasons. First, strawberry picking is seasonal labor and must be pieced together with other fieldwork, sometimes involving travel to nearby counties. Second, and more important, it is back-breaking work. So the higher wages earned by today’s strawberry pickers are not nearly high enough to attract other low-income earners. Down in Baja, strawberry harvest workers—no surprise—make much less than they do in Southern California. Even after a successful labor action last year, strawberry pickers’ wages are a little less than 200 pesos, or about $11 USD, per day. The shift of the strawberry business further south should be a real boon to Mexican agriculture, food processing, and trucking. For the agricultural sector here in the United States, profits will be lower as land ideally suited for strawberries will be used to grow feed corn. So if labor is cheaper in Mexico, why doesn’t more of the strawberry business move south across the border? Soil and climate quality in California are a factor. And the labor price differential isn’t yet so much as to force the move south. Strawberry farms here can still find people to work in the fields. But there is an issue: The people willing to pick strawberries in Ventura County for $18.75 per hour are not Americans. They are Mexicans willing to brave the hazards of slipping across the border and living in the United States undocumented. But the United States is changing. And so the delicate balance that allows both Southern Californian and Mexican strawberry operations to prosper is under pressure. The issue? The Trump Administration has vowed to deport undocumented residents. And where more effectively to deploy the limited resources of the U.S. Immigration and Customs Enforcement agency (ICE) than where there is a concentration of the undocumented: in the strawberry fields? Whatever one thinks of Trump’s change in policy, it’s inarguable that it will impact both California and the U.S. economy. The immediate impact of deportations will be a shortage of labor. This is what was experienced in Georgia when an employer verification law went into effect in 2012. According to separate analyses by Forbes and NPR, farmers left up to 30 percent of peaches and blueberries unpicked in the orchards; farmers also engaged in a failed attempt to enlist prison labor to replace what was estimated to be up to 11,000 fewer agricultural workers. So, California and the United States will have fewer strawberries picked and the berries in the market will command higher prices. But this is just the initial impact. In the longer run, farmers will either pay pickers more, perhaps much more, or they will plant something else, specifically crops like wheat and corn that can be harvested by machines, And these mean even fewer strawberries and even higher prices. But that is not the end of the story. The same people who have been picking strawberries up and down the California Coast will still be picking our strawberries. They just will be doing it south of the border. Let’s summarize the costs and benefits. The shift of the strawberry business further south should be a real boon to Mexican agriculture, food processing, and trucking. For the agricultural sector here in the United States, profits will be lower as land ideally suited for strawberries will be used to grow feed corn. There also will be less demand for goods and services in the U.S. communities now serving the undocumented, and the juicy red fruit will take more of our personal budgets at the checkout stand. Finally, there is the unintended consequence of a larger trade deficit. President Trump campaigned on closing the deficit with Mexico. The deportation policy moves in the other direction as more profits from the strawberry trade accrue to Mexican land barons rather than California farmers. So by itself, it is a policy of “choose your poison.” You can engage in mass deportations with consequent lower income for American farmers and their Mexican farm workers, and increase the trade deficit. Or you can forego mass deportations, thereby increasing the income of American farmers and their Mexican farm workers, and keep the trade deficit with Mexico no greater than it is today. But you can’t do both. If you’re willing to think beyond deportations, you’ll find other options. One option would be to normalize the status of undocumented farm workers, perhaps via a new version of the bracero program of 1942 to 1964 that permitted U.S. farmers to recruit temporary agricultural help from Mexico. If lessons from that program’s history were kept in mind, a new guest-worker regime could correct the flaws of the previous program. It also would have the side benefits of reducing illegal border crossings—U.S. farms would not be providing jobs to newly arrived undocumented immigrants—and this would allow undocumented immigrants already here to come out of the shadows. Or there might be something akin to the 1981 Voluntary Export Restraint (VER) program between the United States and Japan that established a quota on Japanese exports of cars to the United States. A VER for strawberries from Mexico would take care of the trade deficit consequence of deportations, through limits on Mexican strawberry imports. But these limits on imports of Mexican strawberries would exacerbate the shortage of strawberries in our supermarkets and would make St. Valentine’s Day even more expensive. And this is just strawberries. In 2015 Mexico exported almost $22 billion of agricultural produce to the United States. Strawberries are just the tip of the iceberg.